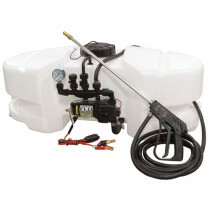 The Manifold Sprayers available here at SpraySmarter.com are versatile sprayers that are able to be mounted in a variety of ways to suit any given application. The sprayers are designed to spray chemicals such as herbicides and insecticides and are designed as a diaphragm model sprayer. The tank is durably constructed and has chemically resistant properties to provide additional strength.